Adjusting Strategy and Increasing Donations to Mercy Flight of Western N.Y.
Mercy Flight of Western N.Y. (Mercy Flight) is an independent, not-for-profit provider of emergency air medical transport. They ensure rapid, safe and cost effective delivery of expert emergency response teams. Over the past 30+ years, Mercy Flight has conducted more than 20,000 patient missions and thousands of Ground Crew Safety Training and Community Education sessions throughout its primary service area of Western New York, Northwest Pennsylvania and Southern Ontario. 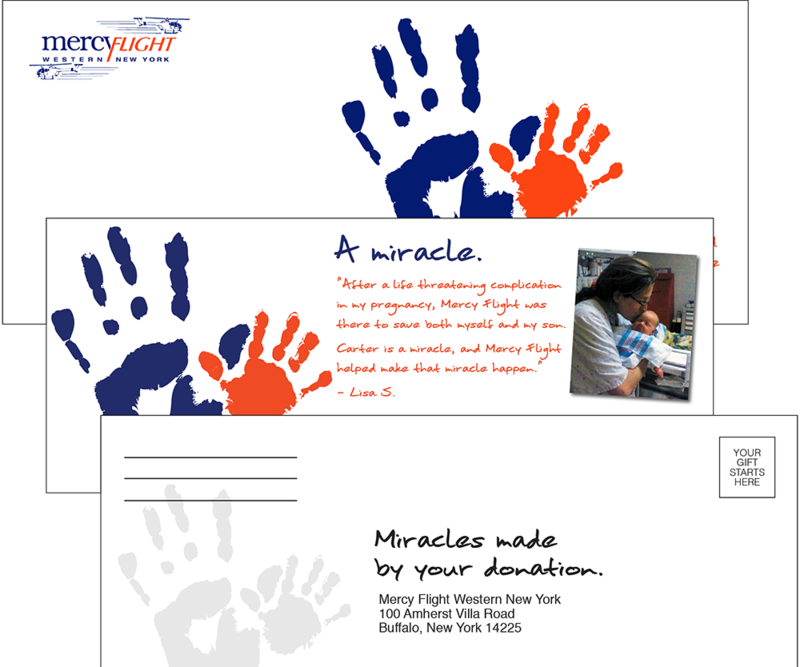 The spring 2015 Annual Fund direct mail campaign for Mercy Flight presented the dual challenge of maximizing a limited client budget and of identifying the most optimal individuals with the propensity to donate. Current donor and acquisition messaging had become redundant from campaign to campaign, and the organization was eager to implement a new strategy due to decreasing donations. We began crafting our direct mail strategy by evaluating the past efforts and response rates of their two largest segments: donors and potential donors (acquisition). Two client strategy meetings were then held. As a result, several conclusions were drawn that would help shape strategy for the upcoming campaign. First, the Mercy Flight brand was well known to the average Western New Yorker. Second, due to brand familiarity, it was determined that Mercy Flight did not need to engage its donors or potential donors with information about general operational details. A long and emotionally heart-wrenching story was also unnecessary in creating a connection with the current donor base. Next, our strategy needed to address balancing the cost of the production, postage, and natural donor attrition. We needed to identify new individuals with whom to share the Mercy Flight message, something that proved to be difficult when working with a limited budget. In order to tackle such a feat, our first exploration was to analyze their existing contact lists to determine who should be mailed to. Through extensive data analysis, it was determined that response rates decreased dramatically for individuals who gave six or more years prior. Therefore, we would only concentrate on those who gave in the last five years. This was a departure from previous strategy where all donors were mailed to for each mailing. Even with this adjustment, the issue of how to acquire new donors still needed to be addressed. Through our internal list-buying experience, it was determined that a rental file of individuals who donated to both emergency causes and police/fire departments in the service areas of Mercy Flight would be required. Initial counts resulted in a mail quantity that was too large and needed to be cut down to fit our budget. Using the past donor file, a hierarchy of zip codes was established based on likelihood to donate. As a final data check, the donor file and rental file of potential donors were cross-referenced to prevent duplication. We were able to effectively trim the list back to our desired quantity using this hierarchy. With all of these factors in mind, several tried-and-true fundraising principles were abandoned. However, one that did remain consistent with more traditional fundraising strategy was mail piece format. We oversaw the development of mail package that included an 8.5 x 3.5 response card, a reply envelope, and a #10 carrier envelope. The concept and theme for creative was inspired by an interview with someone who experienced the lifesaving services of Mercy Flight firsthand. Inspired by an expectant mother, the usage of two hand prints and light copy was used to provide symbolism for the lifesaving story of the mother and her unborn son. Our team developed a targeted, cost-effective direct mail program that reached 49,894 people at a cost $0.30 per piece (including postage). The total investment of $15, 123.66 included creative, copy, production, and postage. The campaign was mailed May 29, 2015, and resulted in 1,534 donations totaling $81,087.77, making it one of the most successful campaigns in the history of their annual fund. Mercy Flight of Western N.Y.